For a view of the building in a wider context, see NS3882 : South Lodge of Cameron House. It is beside NS3882 : Old Luss Road. Various details on the lodge are depicted separately: see NS3882 : South lodge: monogram above door and NS3882 : South lodge: coat of arms above window, whose locations are visible in the present photograph, and NS3882 : South lodge: crest detail and NS3882 : South lodge: date stone, located on other sides of the lodge. 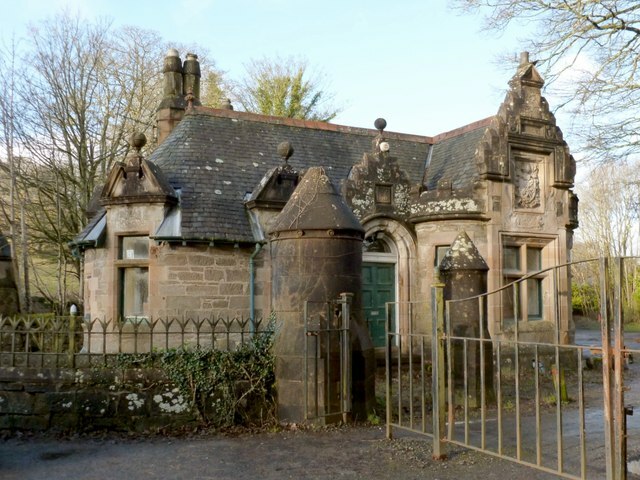 According to the Dictionary of Scottish Architects website, the architect for this lodge was almost certainly John Burnet (senior), with his youngest son, Sir John James Burnet, as junior partner.